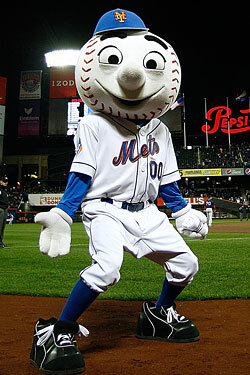 Getting a job with the New York Mets isn't easy. (Just ask Adam Rubin!) But if it's your dream to pick up Razor Shines's dry cleaning, here's your big break. Bentley University is offering high-school students a chance to win a one-month internship with the team, and what better way to recruit employees than a good old fashioned essay contest! All you have to do is explain in 50 to 100 words why you'd like to work for the Mets. (That may not sound like a lot, but by our count, you could begin with "Because I want to meet Keith Hernandez" and still have 93 words to play with.) Technically, the internship is with the club's website, but it's billed as a way to "break into the business of baseball," so who knows where it could lead. It doesn't say exactly what interns would be doing, but we'd assume a typical day with this year's team would include making copies, answering phones, and playing shortstop. If you're wondering about the logic of a school in Waltham, Massachusetts, offering an internship with the Mets, we're pretty sure there isn't any. But there's a Red Sox internship available, too, in case your goal in life isn't necessarily to work for the Mets, but just to work for any organization that sufficiently dislikes the Yankees.